I first came across this recipe while watching the Rachel Ray show, from a treadmill, at a hotel, on Thanksgiving weekend, in Lincoln Nebraska. Not that any of that matters, but I remember it so well, I figured I would share it! I have this habit of watching things involving food from the treadmill, which probably defeats the purpose of exercising, since it makes me hungry, but I have gotten some great recipes that way! This braised beef recipe is simply to die for. The wine makes it super rich and the beef itself is incredibly tender. It is the first thing that I made in my new Le Creuset French Oven. The recipe is made by layering the ingredients, which makes it look very pretty before it goes into the oven. 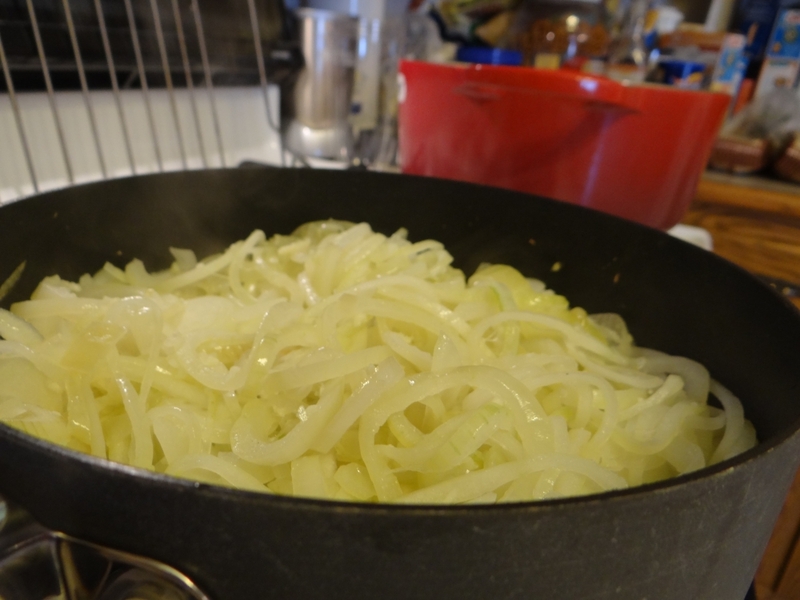 It begins with sauteing up a bunch of onions. 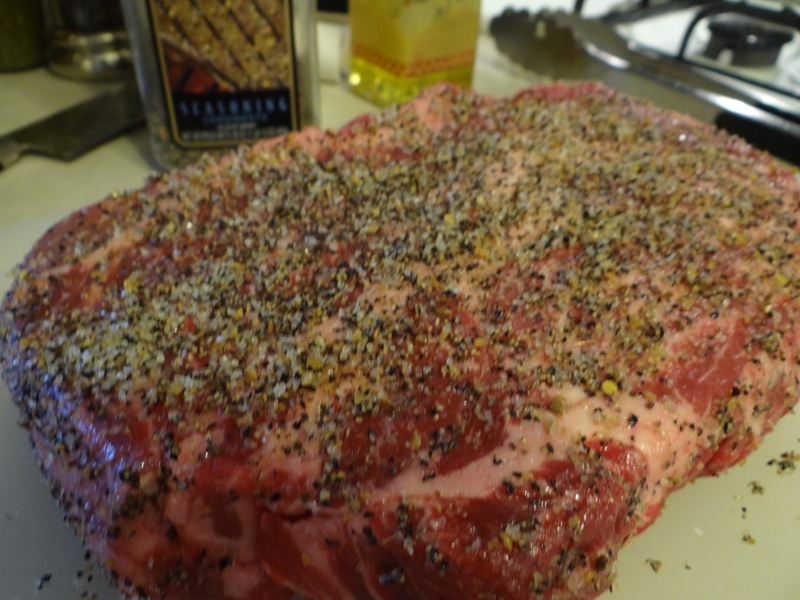 Next, a beef roast is coated in salt and pepper, then browned on all sides. You can do that right in your Dutch oven. I use Montreal Steak seasoning, which is heavenly for all sorts of beef dishes. Once done, the pan is deglazed with red wine. 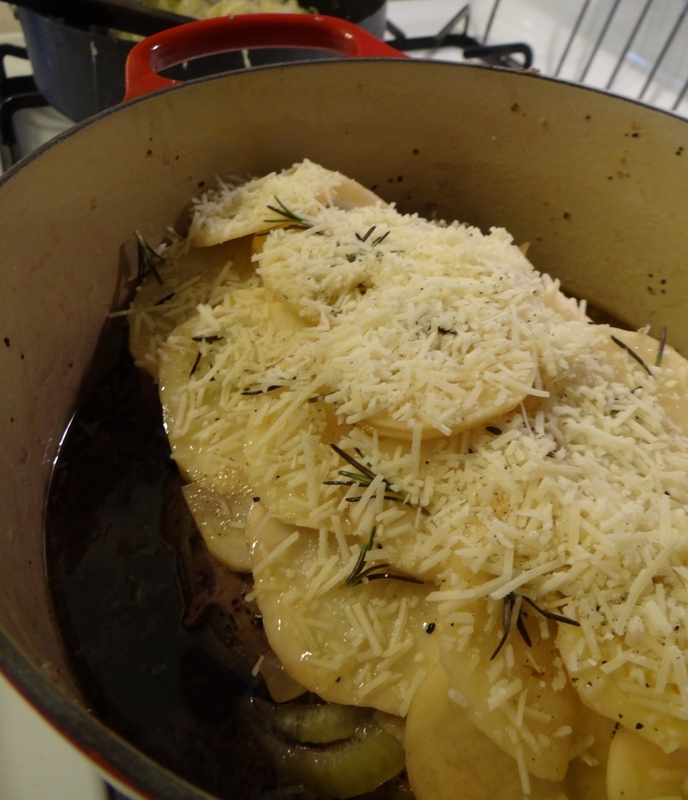 The beef gets topped with layers of onions, thin sliced potatoes, tomatoes, rosemary, thyme, olive oil, and Parmesan cheese. Yum! 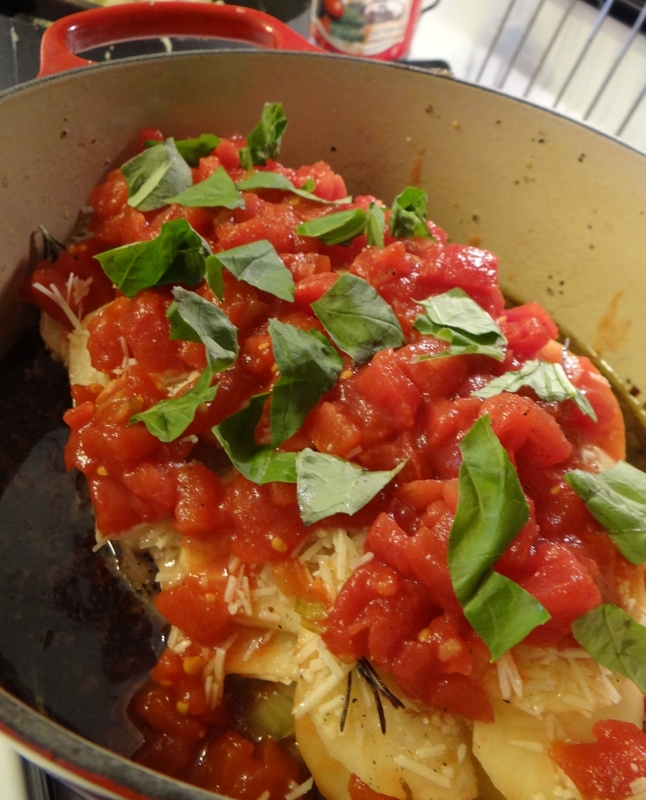 Some fresh Basil is also added to the top before it all goes in the oven. It looks quite pretty. Like I said, the finished product is to die for. Serve it with a glass of red wine and some good crusty bread for dipping in the juices! This reheats well too. Simply put it in the oven for 45 minutes to an hour. Red wine braised beef with onions, potato, tomatoes, and parmesan cheese. In a large skillet, heat a thin layer of olive oil over medium heat. Add the onions and garlic, and sweat until very soft and light caramel in color (about 20 minutes). Season the meat with salt and pepper (I like to use Montreal Steak Seasoning). Over medium-high heat, heat a thin layer of olive oil in a Dutch oven and brown meat on all sides. season with salt, pepper, and half the thyme. Add the rosemary, Parmesan, and salt and pepper to taste. Top the layer with half the tomatoes and their juices and season with salt and pepper. Scatter in a few basil leaves. Cover the pan and roast in the oven for 3 hours. Turn off the oven but leave the pot to sit in the oven for another hour. To serve, cut into pieces and spoon the sauce over the meat.